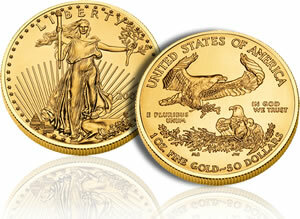 The United States Mint suspended the sale of American Eagles for re-pricing. The move is temporary and sales should be continued later today. This is another example of how the US government has no understanding of the free market. As the price of a commodity or service increases, the cost also increases accordingly. Although the converse is true, when it comes to gold, its price only increases as our economy and dollar declines. Is there an issue with the supply of gold to the mint by the government? Maybe, but more the more credible answer is just a lack of knowledge of Capitalism. A spike in gold prices prompted the U.S. Mint to suspend the online sale of gold collector coins Tuesday for the first time in recent memory, a mint spokesman said. Sales were suspended at midday for re-pricing, which was expected to be completed by late Wednesday, he said. The American Eagle bullion coins for investors are sold only to authorized wholesalers — not directly to the public — and move with the London spot prices. Their sale was not affected, White said. This entry was posted in Editorial, Financial and tagged American Eagle, Gold, Mint, NC Renegade. Bookmark the permalink.